Ceramic Pro is a clear, liquid nano-ceramic coating that can be used in automotive, marine, industrial, and home applications. Ceramic Pro provides a bond with the materials surface, creating a protective coating that is proven to last for years! 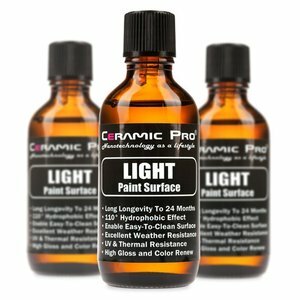 The Ceramic Pro Sport package is a great intro to ceramic paint coating! It comes with a 6-month warranty and adds a glossy coat to your vehicle that makes washing your car an easy task! 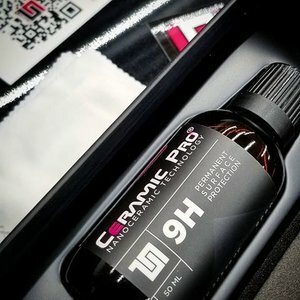 The Ceramic Pro Bronze package is an excellent value! It comes with a 2-year warranty and will give your vehicle hydrophobic properties making washing your car as easy as 1-2-3 with dirt and grime sliding right off! Our Ceramic Pro Silver package is very popular and a great value! It comes with a 5-year warranty and will protect your vehicle and make maintenance a breeze! The Ceramic Pro Gold is the ultimate in paint protection. It comes with a lifetime warranty and will protect your vehicle’s paint against the elements out here in Oregon.